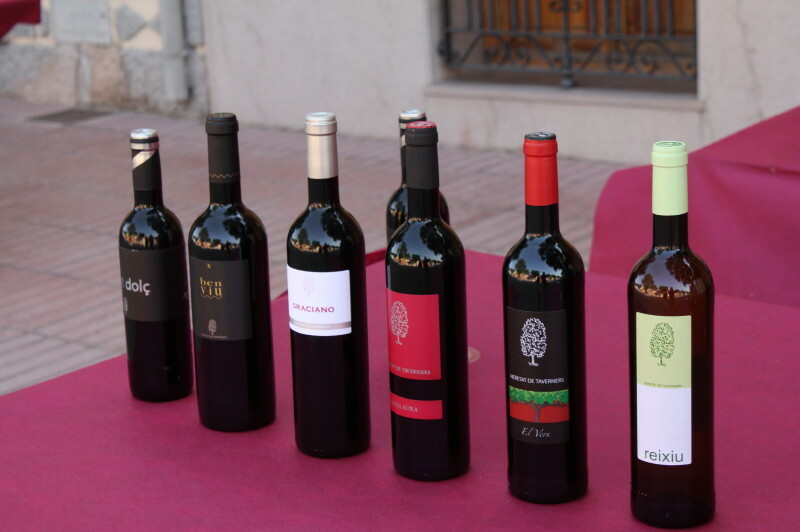 In recent years Valencia has produced some very interesting new wines.The great bulk of wine made under the official Denomination of Origin of Valencia is produced in the Utiel-Requena region. There really are some great wines wine coming out of that region but it is another and much smaller and less well known area to which I dedicate this humble post: “Terre de Alforins” which is basically the area around Fontanares de Alforins and Mogente in SE Valencia, bordering the northern climes of Alicante province. It is a region which has produced wine for centuries but until recently had not achieved much impact on the wine market owing to its small volumes and old fashioned and standard wines. That has changed dramatically in the last ten years with various projects in different “bodegas”(wineries) meaning important investments in machinery,variety selection and people. Wineries such as Heretat de Taverners, have invested in developing new wines working hard to achieve products with a difference.They have a range of wines including their great red Ben Viure and their deliciously crisp and refreshing white Reixiu. A young, small but very professional team have made some really interesting wines. And there are many more such as Celler del Roure, Daniel Belda, Rafa Cambra who all produce some excellent wines.This last Saturday the Seventh Gastronomic Fair of Fontanares which is called “El Mon de Vi” (The World of Wine) took place. It is a very small event and to be honest too small.They need some more stands, more food and maybe they should think about changing the date to May. It was so incredibly hot!! Anyway it was nice to see friends and meet new people whilst trying some of the best wines in the region. The Dansa de La Moma. from Bodegas Los Frailes…a favourite of mine. A must try! All the principal wineries were present and it was a pleasure to try all those cold whites. I have to admit I couldnt bring myself to try the reds(fortunately I know most of them already!!) as it was still 38ºC in the street and even with such good wine on offer only the white was enticing! The great thing about Fontanares is that it is a very small village and so everyone knows everyone else.The village has maybe three bars and the famous Julio’s bar and next door restaurant that is the epicentre of the town in terms of gastronomy. Julio’s is something very special, modern and tradtional cooking mixed to make an amazing menu with some really delicious and innovative dishes. Virtually every dish is a surprise.The experience of eating there is well worth it. The surrounding ountryside is a mixture of patchwork vineyards and forests set in rolling hills away from “the madding crowd”. It is often referred to as the Valencian Tuscany. It really is a beautiful hidden corner of the interior especially in the spring and summer where you can walk through the forests and vineyards and really feel you are deep in the countryside and in contact with the authentic rural life in the interior of Valencia. The enchanting scenery combined with charming wineries and the opportunity to taste the local wine makes this a little wine paradise! Not only does The Spanish Thyme Traveller take tours to visit the local bodegas they also include on two of their holidays, walks through the surrounding countryside enabling their customers to enjoy the picturesque scenery and understand the local tradition of winemaking. The walking is fun and reasonably easy.Their Borgias Tour is a perfect combination of outdoor and cultural activities and inlcudes a lovely walk through the vineyards and a visit to the remains of the Ibero fortified mountaintop village, a historic gem hidden in beautiful shady pine forest. Both in the Fontanares region. Best time of year to visit: Sept/Oct are perfect as are April/May. This entry was posted in bodegas, spanish culture, wine, wine tours and tagged bodegas, Food, gastronomy, Spanish wine, tours, Valencia, vineyard walks, wine tours, wineries, winetasting by Paddy Waller. Bookmark the permalink. Great info. I am always looking for new wines.